I know a few people who put Christmas trees in each of their kids rooms. I love the tradition, but am not sure I have room to store three more Christmas trees. 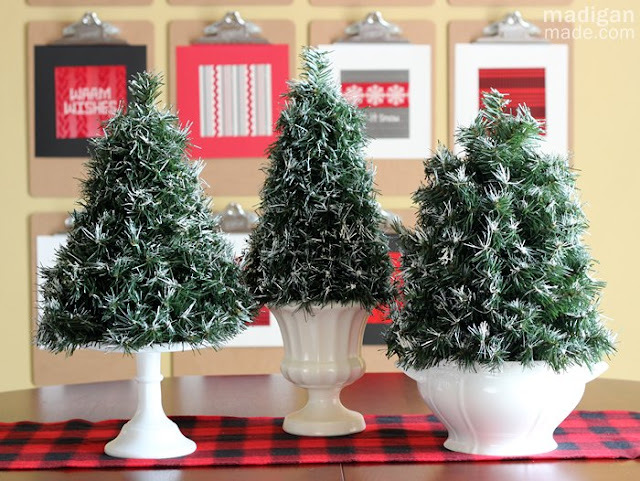 These cute mini Christmas tree topiaries might make a good substitution though. A small strand of mini lights and a few light weight decorations and your kids could each have a cute little tree in their room. They also make a beautful centerpiece. You can check out how to make these flocked topiary Christmas trees over at Madigan Made. Such a pretty Christmas photo. I'm going to have to go check out this blog!